El Palauet Living Barcelona is a five-story, city-center mansion built in 1906. It is also an extraordinary example of modernism. The six two-bedroom, two-bath, lavishly spacious apartment-style suites can each accommodate up to four guests. Not that you’ll want to share the impeccably designed spaces, which manage to combine authentic art nouveau and baroque architectural details (frescoed ceilings, stained-glass windows) with modern furnishings. 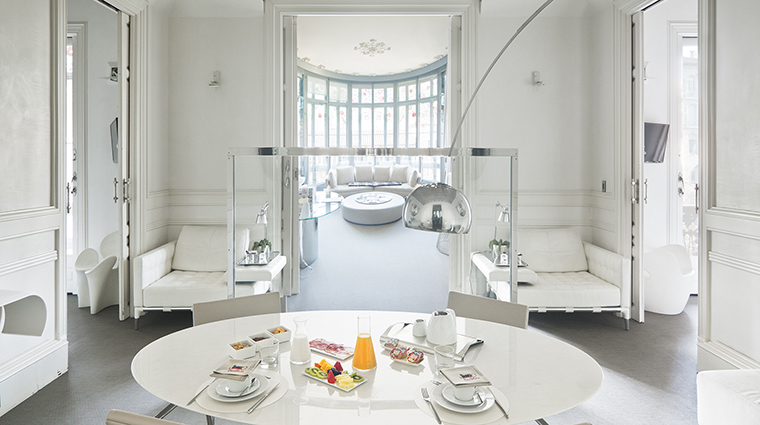 The all-white rooms are large, light-filled affairs that serve as a delightful retreat after a busy day of exploring Barcelona. • Privacy and tranquility are assured at El Palauet Living, as just two suites are on each floor with a common foyer off the elevator. • The landscaped rooftop terrace has a panoramic view of Barcelona — head here for epic sunsets over the city with a cocktail in hand. • The spa facilities are also on the rooftop and include a wooden Finnish sauna, a treatment room, outdoor Jacuzzi with hydro-massage beds, and a solarium for sun tanning. • The furnishings will delight design geeks. The rooms are filled with contemporary pieces by an array of top designers, including Charles and Ray Eames, Eero Saarinen, Warren Platner, Arne Jacobsen, Mies van der Rohe, Philippe Starck and Antonio Citterio. 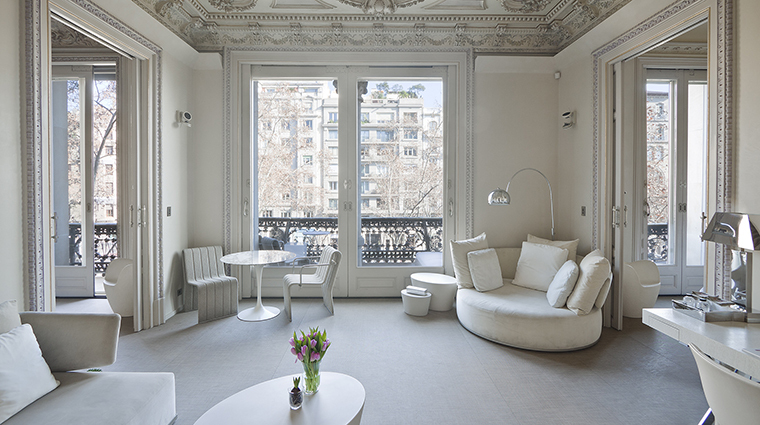 • The boutique hotel is located just north of Passeig de Gràcia and Avinguda Diagonal, where the boulevard narrows into a charming tree-lined street divided by a parkway with gardens and sculptures. This is an unbeatable starting point from which explore the authentic architecture of Barcelona. • The architect, Pere Falqués, is also known for his ornate lampposts jutting from ceramic tile benches that are sidewalk landmarks on Passeig de Gràcia. The façade of El Palauet reflects the great prosperity, creative genius, and unbridled imagination of the era. • Technology is important at El Palauet. You’ll find touch screens that control mood lighting, temperature, music selection (from the hotel’s music library), sound level and automated curtains. High-definition TVs and DVD players are in all the suites, with additional TVs in each bedroom. • There are no restaurants at El Palauet, but a chef can stock up your suite’s kitchen, as well as cook breakfast (if you so choose) with a wide menu selection, including Catalan specialties. 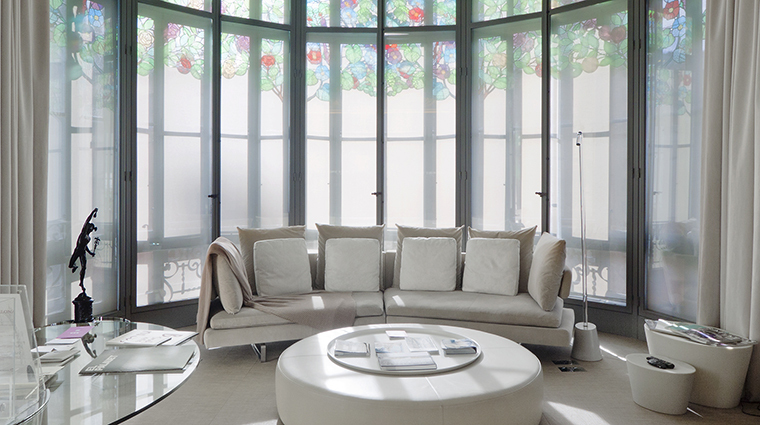 • The Passeig de Gràcia Suites have balconies and face east overlooking the famous tree-lined boulevard. On the opposite side of the building, the Tibidabo Suites have west-facing small private terraces that peer out over grand convent and Tibidabo mountain. • Suites are all-white affairs decorated with Corian seamless surfaces, modern designer furniture and sculptural design accents from lighting to bathtubs. All the of-the-moment furnishings mesh with the baroque original details of the building, from its modernist design motifs to the elaborately molded ceilings. • A personal assistant is assigned to each suite. The assistants are multilingual, well-informed about Barcelona tourism, museums, shopping, entertainment and dining, and are tasked with making any arrangements — from breakfast in bed to theater tickets — you may want. • The luxury hotel is located on Passeig de Gràcia, which means you have the best shopping in all of Barcelona at your feet. It would take days to explore all of the boutiques that line this famous avenue. • Along Passeig de Gràcia are some of the best architectural examples of the elaborate modernist style designed by masters like Gaudí (his La Pedrera apartment block is three blocks away) and Puig i Cadafalch. • Barcelona’s beaches are about a 20-minute walk from the hotel — after sunning yourself, meander back to El Palauet but not before stopping in a café or two for a late afternoon cocktail.